Q: First, the DPRK failed in its missile launch yesterday in Sinpo, South Hamgyong Province. It is a provocative action taken by the DPRK side when the situation on the Korean Peninsula is very sensitive. What is your comment? Second, the US White House official said that the THAAD deployment issue shall be decided by the new ROK president, and later the US and ROK governments said that there was no change to their position on the THAAD deployment. What is your comment? A: On your first question, we saw relevant reports as well. We have said many times that the current situation on the Korean Peninsula is highly complicated and sensitive, or rather in face of a high level of risk. We keep reiterating that all relevant parties should avoid taking provocative actions that further fuel tensions and make efforts to ease the tense situation on the Korean Peninsula so as to create necessary conditions for all parties to get back to the negotiating table and properly resolve the Peninsula issue through peaceful means. On your second question, the Chinese government holds a consistent and clear position on opposing the US deployment of the THAAD system in the ROK. This position is subject to no change. We hope that all relevant parties can bear in mind the long-term interests of the region and various countries, truly preserve long-lasting peace, stability and strategic balance of the region, and stop the deployment process. 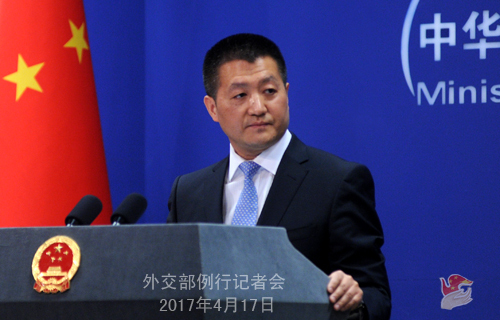 Q: The Chinese Foreign Ministry announced that the 7th China-EU High-level Strategic Dialogue would soon be held in Beijing. With the Brexit looming in the background, this round of dialogue has attracted great attention. Could you provide more details on this dialogue? What is China's expectation for it? 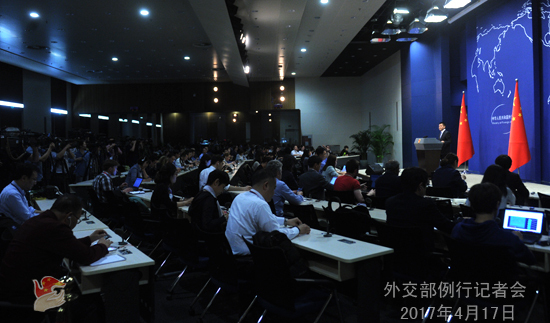 A: We announced last week that as agreed by the two sides, on April 19, State Councilor Yang Jiechi and Federica Mogherini, EU High Representative for Foreign Affairs and Security Policy and Vice-President of the European Commission, will co-host the seventh China-EU High-level Strategic Dialogue in Beijing. China and the EU, as two major forces in the world, are each other's comprehensive strategic partner. The steady development of China-EU relations is of significance importance. Upholding a consistent policy towards Europe, China always supports the European integration and holds an optimistic view on the future of Europe and the EU. We also hope that Europe could continue enjoying prosperity, stability and openness. At present, the China-EU relationship is growing soundly, with steady progress made in moving forward the four partnerships for peace, growth, reform and civilization. The two sides are attaching greater importance to enhancing strategic communication and coordination on major international affairs. Considering the complex and profound changes the international situation is undergoing, China and the EU will engage in the Dialogue to chart the course for the next-stage development of China-EU relations and have an in-depth exchange of views on international and regional issue of mutual interest so as to consolidate mutual trust, promote cooperation and preserve the momentum of steady development for China-EU relations. I would like to add that the regular holding of such high-level strategic dialogue itself speaks for the fact that the China-EU comprehensive strategic partnership is operating at a high level. Q: Which official did China send to participate in the military parade held in the DPRK? A: We have said from this podium that China and the DPRK are friendly neighbors. The two sides maintain the tradition of friendly exchanges. Follow-up: Special Representative Wu Dawei of the Chinese government on the Korean Peninsula affairs reportedly visited the DPRK on April 15. Can you confirm it? A: I wonder where you got that information. As I said, China and the DPRK maintain the tradition of friendly exchanges. We remain in close contact with relevant parties, including the DPRK. Q: In an interview with US media on April 16, US National Security Adviser Herbert McMaster said that the bottom line is to stop the DPRK's weapons development and make the Korean Peninsula nuclear-free, and that this is a situation that just can't continue, and it's time for us to undertake all actions we can, short of a military option, to try to resolve this peacefully. What is your comment? A: We have seen relevant reports as well. Leaving no peaceful options unused in pursuit of denuclearization of the Korean Peninsula represents a right direction forward and complies with the interests of all relevant parties. In fact, to realize denuclearization of the Korean Peninsula and preserve peace and stability there is also the goal the Chinese government has been consistently advocating, which we believe shows the only way out of the Korean Peninsula issue. You might all know that China raised a dual-track approach to resolve the Korean Peninsula issue and a suspension-for-suspension proposal as a first step to kickstart dialogues. We hope that such approach and proposal, born out of the highly complicated, sensitive and risky situation on the Peninsula at the moment, can work effectively to ease tension on the Peninsula and create favorable conditions to bring all relevant parties back to the negotiating table which then leads to the final settlement of the issue through peaceful talks. As Foreign Minister Wang Yi said last week, we are open to all proposals made by other relevant parties as long as they are viable, feasible, and conducive to resolving the Korean Peninsula issue through peaceful negotiations. We welcome the positive role played by the US, one of the most important parties in this issue. We would like to remain in close communication with all relevant parties including the US to jointly contribute to realizing denuclearization of the Korean Peninsula, maintaining peace and stability of the Korean Peninsula, and resolving the Korean Peninsula issue through peaceful negotiations. Q: US Vice President Pence said in Seoul today that China has extraordinary levers that can be used to put pressure on the nuclear and missile program of the DPRK. Do you agree that China can do more to stop the nuclear program? A: Since the first day of the Peninsula nuclear issue, China has made great efforts in achieving denuclearization of the Korean Peninsula, upholding regional peace and stability, and promoting a solution of the Peninsula nuclear issue through dialogue and coordination. These efforts are recognized by all. However, as we said before, China is not the culprit of the issue, nor does it hold the crux and the key to resolving it. Resolving this issue needs all relevant parties, especially these that are key players with major responsibilities, to work towards the same direction and make concerted efforts. 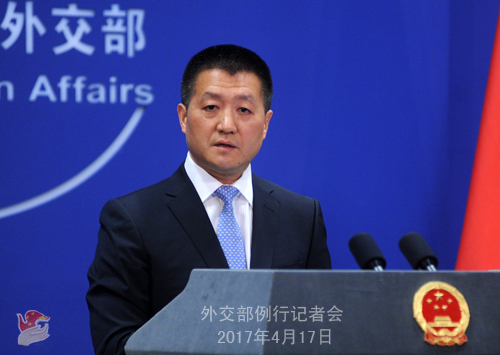 Q: According to the press release of the Chinese Foreign Ministry, State Councilor Yang Jiechi yesterday had a phone call with US Secretary of State Tillerson when the two sides exchanged views on the current Korean Peninsula situation. Can you give more details? Did this phone call happen because of the missile launch of the DPRK? A: I will take your second question first. China and the US maintain close high-level contacts and exchanges. We said from this podium last week that the two presidents agreed in Mar-a-lago to remain in frequent communication so as to implement consensus reached during the Mar-a-lago meeting, expand all-around practical cooperation, constructively manage disputes, and strive for better development of bilateral ties in the new era. Therefore, the phone call between State Councilor Yang Jiechi and Secretary of State Tillerson only came naturally. I personally didn't see any necessary connection between it and any particular event. Q: According to Air China, flights to Pyongyang won't be available until sometime next year. Could you tell us if this is a decision by the Chinese government? What is the reason for the unavailability of the flights? A: Air China has already released a statement. Commercial airlines make adjustments to their schedule in accordance with their business and market performance. This could happen to Air China, to other Chinese airliners, and to foreign airline companies as well. There is no need to overinterpret this. Q: About US Vice President Pence's remarks in the ROK, he said that the US is fully confident of China correctly handling the DPRK issue. What is your comment? A: China's policy on the Peninsula issue has been correct all along. Its correctness does not start from today. In the meantime, we hope that all relevant parties, especially these major players to the Peninsula nuclear issue, could also adopt correct policy as China does. Q: US Vice President Pence said in the ROK that the US is concerned about China's retaliation against the ROK. What is your comment? A: China and the ROK had been enjoying very friendly relations until the ROK government decided to go along with the US and deploy the THAAD system in the ROK. In fact, before such a decision, China-ROK relations had reached a climax. It is not China that have reduced the bilateral relations to the current state. We truly hope that the relevant party could change course and undo its wrong decisions so as to create necessary conditions and atmosphere for the China-ROK relations to return to a sound track of development. 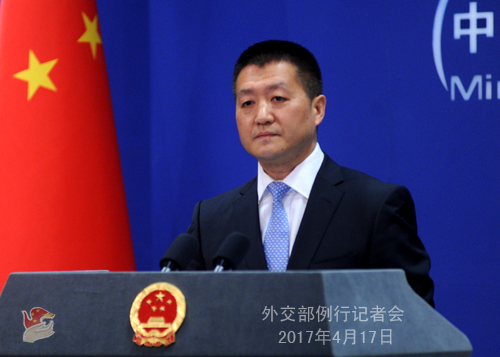 Q: After the Dalai Lama's visit to the disputed territories in the east section of the China-India border, the Indian government clarified that there's no change to the position of Tibet being part of China and will continue to seek a fair, reasonable and mutually acceptable solution to the boundary question. What's your comment on this? A: I have noted relevant statements. For some time, due to reasons known to all, the political foundation for China-India relations has been damaged, casting a shadow over bilateral relations and the boundary negotiations. What is imperative now is for the Indian side to take concrete actions to honor its solemn promises on Tibet-related issues as well as the important consensus reached by the two sides on settling the boundary issue, in particular never again using the 14th Dalai Lama to undermine China's core interests, so as to create a good atmosphere for greater mutual trust between the two countries and proper settlement of the boundary question. Q: US President Trump tweeted yesterday that as China and the US are cooperating to tackle the DPRK issue, he sees no reason to label China as a currency manipulator, and he suggested wait-and-see. What is your response to his remarks, especially him explicitly linking these two issues? A: I already responded this question last week. On the currency issue, China's policy is very clear. China has never been and is not a currency manipulator. It is an objective fact. On the Peninsula issue, China has been doing its utmost for so many years to promote dialogue and consultation and peacefully resolving the Peninsula nuclear issue. We also hope that all relevant parties could make joint efforts towards this grand goal. Q: For the first time, the Chinese military is conducting a joint military exercise with Nepal. What's the significance of it? How China looks at this specific development? A: China and Nepal are two friendly neighbors. I believe it is a good thing for the two countries to expand practical cooperation in various fields and promote common development, including making joint efforts to maintain regional security and stability, through friendly consultations. Many neighboring countries around the world engage in such cooperation endeavors. The joint military exercise you mentioned is agreed upon after friendly consultation between the two militaries. Dubbed as "Mount Everest Friendship" and held in Kathmandu, Nepal from April 16 to 26, it centers on counter-terrorism. It is part of the annual exchange program between the two militaries. We believe that it will strengthen the two militaries' ability to coordinate with each other in fighting terrorism and help maintain regional peace, stability and security. Q: Vice President Pence said in the ROK that the US wants to achieve resolution through peaceful means while all other options are also on the table. What's China's comment on this? A: Just like what I just said, doing all we can to peacefully realize the grand goal of denuclearization of the Korean Peninsula is the right way forward and is what China has been consistently stressing. We always believe that the only viable path out of the Peninsula issue is to realize denuclearization of the Korean Peninsula and preserve regional peace and stability through dialogue and consultation.